Naomi (maki horikita) runs back to the class to get the camera, as she is on her way with the camera she suddenly falls down the stairs head first. 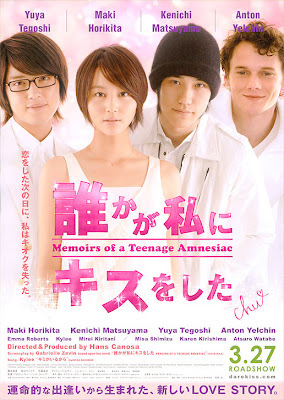 And so she loses 4 years of her memory, the guy that helped get to the hospital Yuji (Kenishi matsuyama) she starts liking, she often meets him at school. But her best friend and co-editer at the yearbook-club Mirai (yuya tegoshi) doesnt like Yuji. A lot of things change for Naomi. She isnt the person people want her to be anymore. She breaks up with her boyfriend and starts going out with Yuji instead. She even quits the yearbook-club and instead joins a drama club. But then Yuji moves to L.A and their relationship isnt as good anymore, she visits him in L.A without her father knowing but it doesnt really help, and when she gets back she is grounded. Later she gets to know that Yuji is hospitalized and visits him. Then he tells her to forget him... And later Mirai gets sick and is hospitalized, so she joins the yearbook-club again and helps finishing the yearbook.. The movie was actually great.. Like imagine how it would be if you suddenly one day didnt know anything around you, like the last 4 years. How were you supposed to act with your friends and all the people that knew you. And how would you know who you really were. Would you just start over or try to go back to who you were. Would you take the chance to change everything. The movie was cool also the cast.. i mean like tegoshi yaay,, and L :D and the japanese accent wasnt too bad either.. (they go to an american school in tokyo) I just thought that maybe it was missing something,, like it wasnt really complete somehow.. But all in all it was a nice movie.. Nice watch.